I am of course going to consider the penchant we have of pigeonholing. We love to sort things into groups and give them names. Then we can ascribe other qualities with a broad and uncaring brush. With life forms we call this taxonomy. With paintings we use categories based on style, content, historical period, use, intent etc. So if we have a painting it might be an illustration or a decoration or fine art and so forth. With taxonomy the rules are clear a life form cannot be a member of more than one genus. With paintings however a work might be comfortably placed in several. So one of Raphael’s frescos in the Vatican might be a) a work of art, b) illustrating a theme, c) decorating a room. d) an example of renaissance painting. Not so easy here to differentiate and put into discrete categories. In conversation with other artists they all seem to agree with the current wisdom that contemporary illustration cannot be considered fine art. However if I ask, “Is Rembrandt’s “Feast of Balthazar” fine art?” they say yes it is. I then say but it is an illustration of a biblical event. I might get the reply that it was a personal response to a story by the artist. I add that actually it was a commission. Then the conversation usually goes down hill from there. Despite it being true in earlier times artists today generally seem unwilling to allow illustration up on the pedestal of fine art, but do wish to share the pedestal with great works of previous eras that I think fall comfortably into the illustration category. I have had this conversation many times now always with the same result, people believe that illustration is somehow inferior in the aesthetic stakes, but cannot come up with any cogent argument as to why that should be true now but not in the past. So what is going on? This post is as much to pick the arguments apart for my own benefit as to promote any views on the matter. I have been both sides of the divide, so maybe that gives me a perspective on the conundrum that gives some small insight. Another area where this effect is seen is literature. A book can be a work of literature, or a genre. If it is genre, say a detective story, then the Booker people are not going to be interested whatever the literary merits. All genres are not equal of course, “historical” is above “mystery” which is in turn above “science fiction” which is above “romance”. These categories are to do with marketing not the end product not with the quality of the wordsmithing in-between the covers. However critics and most readers appear to use the marketing category to assign aesthetic worth. I have lost count of the number of times have recommended a book only to have someone say, “I don’t like science fiction.” I ask have you read any? They say “No” I say have you read “Brave new world” They say, “Yes.” I say “Aha! That’s science fiction!” and once more the conversation goes downhill from there. One thing is always the same, no one will reconsider their opinion and when they have the basis of that opinion questioned and find they cannot justify it they seem to hold that opinion even more firmly that before. If you think I am going to give the impression I am above this trait then you would be wrong. If you read Daniel Kahneman’s “Thinking, Fast and Slow” you might reluctantly have to admit as I did that many of our opinions and most of our intuitively held views are very poorly founded and often wrong entirely. What Kahneman shows is that even when this is pointed out to us we still cleave to our previous opinion because it is programmed in at a lower level. This part of our minds delivers snap judgements on anything and everything without the need for cogitation. In everyday life this is wonderful as it gives us a way of dealing with a hugely complex world that would overwhelm us otherwise. We could not possibly take the time to reason through everything in life. This process works with pictures too. People often say that they don’t like this or that sort of painting. Choose your genre, say Pre Raphaelites. This is one that has caused me a deal of difficulty. One of my first experiences with paintings in galleries was at the Birmingham Art Gallery. Is a boy of twelve or so I was entranced by the glowing colours and did not know to dislike the sickly sweet emotions portrayed. Later when doing a degree in fine art I learnt to dislike them as was de-rigueur in a college of that period. So I had two opposing instinctive responses to that kind of work. If I was a computer I would crash and need to be rebooted, but humans are made of sterner stuff and can believe both opposing views at the same time! If I stand back and am analytic then I would have to say most of the Pre-raph output is average to poor, but I can find some gold amongst the spoil as well. IE exactly the same as any other genre or period of work. Nonetheless despite knowing that when I first glance at one of their paintings it is the unconscious assessments all be it conflicting that are first through the gate. This also works with positives. We might be educated that this or that artist is “important” this in turn makes us see the works in a different way that has less to do with the actual visual stimulus being received than we might imagine. This was brought into focus for me a few years back when I saw a huge Van Gogh exhibition in Basel. I arrived with the learnt and unquestioned opinion that he was one of the all time greats and a pivotal figure in painting. I believe there were 14 rooms in total in strict chronological order. I was entranced by room 13 where his works take on a visionary glow, then less impressed by room 14 where derangement sets in. Puzzled I went back and did the first rooms again. When I really thought and looked as dispassionately as I was able the early rooms were almost entirely between dreadful through to dull but worthy with the odd bright spark of things to come. Looking at the time line it would seem that Gaugin’s influence was the key to Van Gogh’s brief transcendent moment. Van Gogh’s paintings from that period are lovely and decorative, but did they inspire later painters to paint in that manner..? Well like most idiosyncratic artists such as Blake, not really as the manner is so personal. It is very hard for anyone including myself to separate out the received wisdom on Van Gogh as our subconscious has been so well primed. This is not really a problem for a gallery visitor, as they will enjoy the works and not be concerned as to the genesis of their reactions. For an artist it is a different matter, we need to be able to pick out concrete factors that might lift our own work a step up. I am afraid that the knee jerk assessments of our subconscious really do not help in this regard. My intellect tells me that all types of painting from illustration to portraiture to abstraction will throw up up high peaks on the graph of excellence, however personal and intangible the factors that make such judgements are. For myself I try to look out for these highs wherever they might be found. As we all do I will inevitably miss many that might hold useful inspiration merely because my lazy conscious mind is on autopilot and being steered by the unthinking and largely unfounded judgements delivered up by my unconscious. I feel sure this trope will have neither convinced nor unconvinced anybody, but any contrary argument not founded on opinion would be welcome, especially if it confounds me! 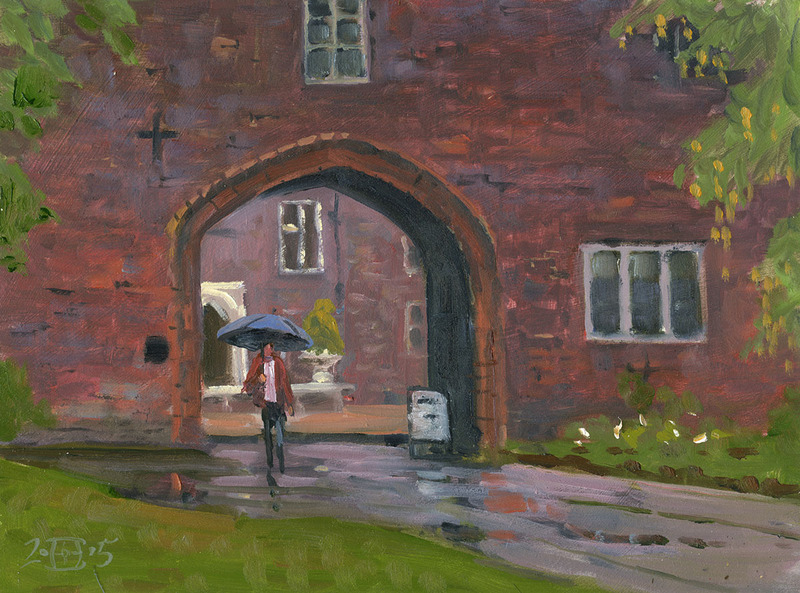 Only a few paintings since last post, I am gearing up to go to France, so the next post will have a continental flavour! 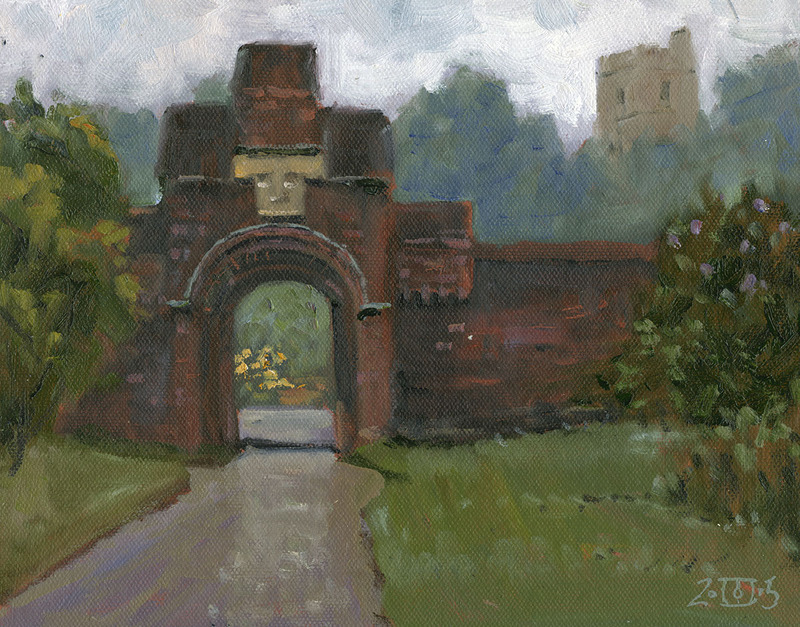 This is the gate to the walled garden at Fulham Palace. It was drizzling and very quiet so I was happy painting away. I loved the soft tones that the rain gave. 8in by 10in oils. The rain really set in after we had had a leisurely sandwich and coffee. I was lucky, sheltered under a substantial tree, others of The Brass monkeys were out in the full downpour… This is the main entrance to the palace, it is a lovely place that the tourists don’t seem to find. 10in by 8in oils. It is hard to believe that this is the same day! After leaving Fulham I drove back to Dorset via the New Forest. 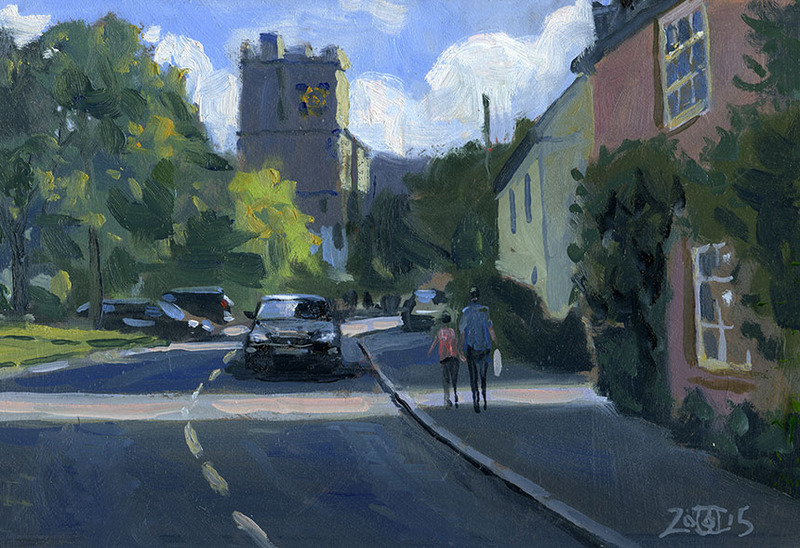 This is Fordingbridge, this scene looked so lovely I decided to stop and paint. Hard to get a good viewpoint, in the end I parked my car conveniently for me and inconveniently for everyone else and painted from in front of it. I was forced to be very quick so this is about 30 minutes worth. 10in by 7.5in Oils. 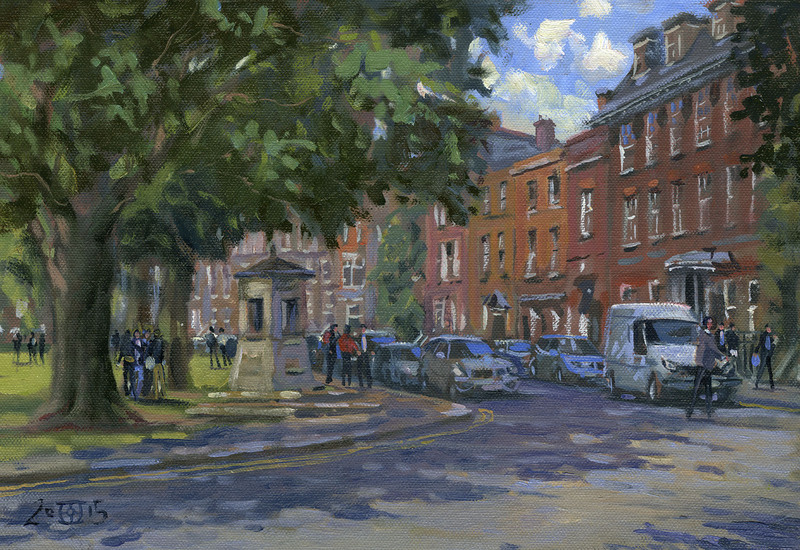 This is Richmond Green on a day out with The Wappers, I have painted this corner a few times before. This time I really struggled, the first one from a different angle I wiped off. 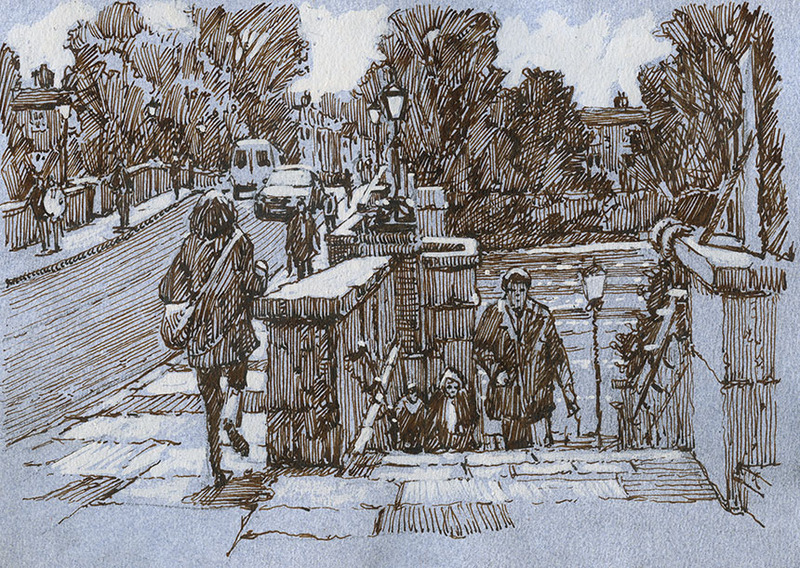 Then I started this but just could not get it to gel, I had bollards across the foreground and some near figures. I had it up on my kitchen dresser for a few days and decided in the end the story was about the line of activity running across the lower third. I took out everything that conflicted with that and suddenly I had a picture. It is always gratifying to rescue a painting that goes astray! 10in by 14in Oils. 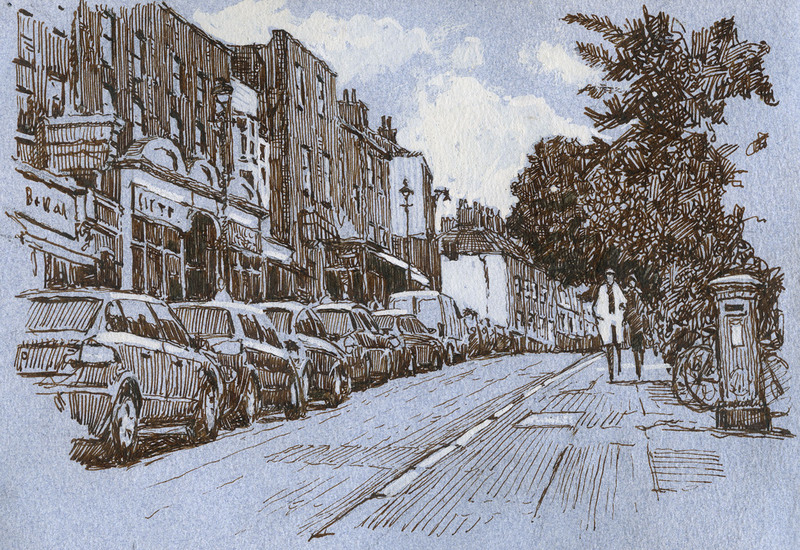 Before I did the last painting I did a couple of pen drawings. This is Richmond Hill, I love the simplicity of the medium. I have a lot of these drawings now and wonder what to do with them. People don’t buy drawings really nowadays, I might get some printed up into cards. Last one. This is Richmond Bridge. It is quite hard to find new views on the River front. This one had taken my eye a few years ago so I decided to have a go at it. Though it looks simple it was avery difficult subject with lots of elements that needed to be right. I did a much more careful pencil layout than normal. I shall do a painting of this at some stage.